The City of Richmond has long wanted another interchange on the freeway. Their preferred location would be Highway #99 at Blundell. The province does not want to do that, but has offered a new partial interchange on Highway #91 at Nelson Road. However, in order to get that Richmond would have to contribute $3m. One of the reasons the City is saying it needs the interchange is to reduce truck traffic on Westminster Highway. This has increased dramatically as the port industrial lands on the south arm between LaFarge and Riverport have been developed. Richmond would like the new access road to be grade separated at Westminster Highway. They can’t have that either. Local councillor Harold Steves is quoted in the paper edition but very oddly, this is left out of the on-line version I linked to above. Steves maintains the province wants to build a new bridge over the South Arm of the Fraser at No 8 Road and the new interchange is needed to facilitate it. The Ministry of Transport never gives up on a defeated road proposal. This one has been around for a long time. It would also have, of course, a new crossing of the North Arm to connect up to Boundary Road. If you look to the map on the left, Boundary Road runs due south from the point where Highway #1 turns east. 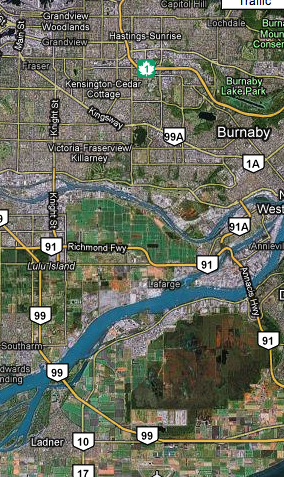 Just draw a mental line due south, and you will see how it neatly falls halfway between the Deas Tunnel and the Alex Fraser, and skirts (or not depending on how you define it) the brown area in the middle of Delta – Burns Bog. It would remove some traffic from both Marine Drive and the Knight Street bridge to the west and the Queensborough Bridge to the east. And it would also add capacity which is currently maximised at the tunnel. While the counterflow system designed to ease commuting to and from Vancouver does help those flows, it does so at the expense of counter peak movements – which have increased significantly as a result of the dispersal of both employment and industry away from Vancouver’s downtown. 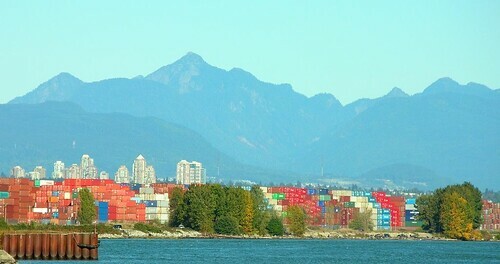 Previous proposals from the MoT fell foul of the Cities of Vancouver and Richmond, as well as creating great concern over the ALR, the Bog and the green zone generally. This route is missing from Transport 2021, which was incorporated in to the LRSP. Of course the province no longer has any concerns about these issues, as it determination to pursue the Gateway project on the south bank of the South Arm demonstrates. You can also see how much of the land south of Westminster Highway is now grey not green. That’s port industrial development, and a lot of it fairly recent. The picture below shows the view upstream from the east end of Steveston Highway. The left side of the picture is almost filled with empty containers stored on new fill, mostly dredged from the shipping channel – a process which is continuing even as I write this. The Review piece is mainly a response to the urging last week of the local MLA to accept the deal that is being offered. There is no response from the Port, but also no word at all from the MoT. The previous minister dismissed calls for the doubling of the Deas Tunnel, saying that is was not a current priority for the province. And, of course, if the long range plans of the MoT never change, which certainly seems to be the case, that might well explain his response. It is probably cheaper now to build yet another cable stayed, post tensioned bridge (like the Golden Ears) than sink more tubes adjacent to the existing tunnel. But more importantly, as Steves notes, it also opens up a lot of land for highway oriented development. In exactly the same way as the SFPR converts land from agriculture to industry in Delta. And as the widening of Highway #1 will facilitate along the valley. Being only a blogger I was not allowed to get inside to hear it. I will have to pick it up later on once the mainstream media have done their thing. Outside a small group of protesters were being very careful not to block traffic – not that there was very much to get blocked. Surrey Fraser Docks are obviously feeling the pinch of tough economic times as well. River Road showed no signs of the congestion that is supposed to justify building a major road through sensitive ecological areas, sacred First Nation sites and a number of communities. Of course the stage management of these announcements has to be very careful. Quite why it needs to be held inside the secure area of the port with no-one but accredited press allowed in I will leave to the participants to explain. I doubt if any of those huddled in the drizzle outside would have thrown their shoes at anyone. Many were people directly impacted – all they had to do was cross the road to join the protest. But of course on a Monday afternoon most people will have been at work or school. I am currently watching “Vancouver at 6” on CBC – and yes they had footage of Campbell and Harper from this afternoon’s farago. No they did not cover the announcement. The story was the Flase Creek athletes’ village. No mention of Gateway or SFPR.